The recent meeting of the Puget Sound Section of ASNE heard Capt. Timothy R.
O'Keefe, USN, commanding officer, USS William H. Standley (CG-32), deliver an address entitled "The Soviet Navy: A Near-Term Capability." 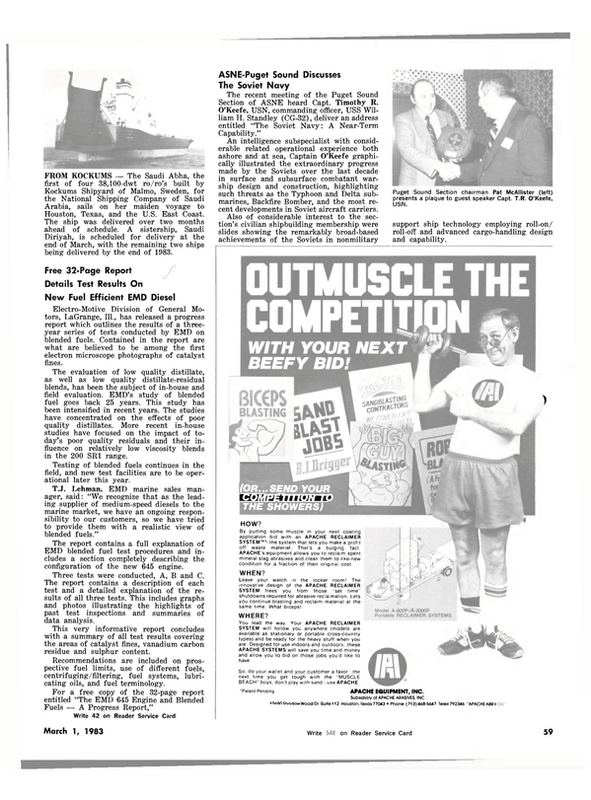 An intelligence subspecialist with considerable related operational experience both ashore and at sea, Captain O'Keefe graphically illustrated the extraordinary progress made by the Soviets over the last decade in surface and subsurface combatant warship design and construction, highlighting such threats as the Typhoon and Delta submarines, Backfire Bomber, and the most recent developments in Soviet aircraft carriers. Also of considerable interest to the section's civilian shipbuilding membership were slides showing the remarkably broad-based achievements of the Soviets in nonmilitary support ship technology employing roll-on/ roll-off and advanced cargo-handling design and capability.